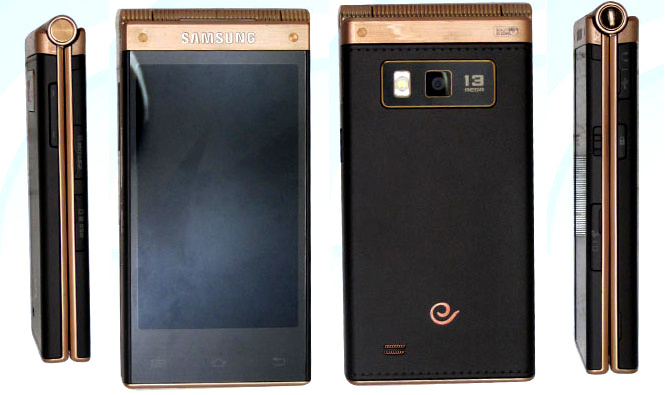 Samsung has been pushing a lot of Android devices lately, and that includes the flip phones too, as we had recently heard about the two – Samsung Galaxy Golden and the Galaxy Folder (which had appeared on the Samsung website in August), and now another new flip phone running the Android OS, was surfaced in China. Codenamed SM-W2014, this device hasn’t been seen with any official name tagged to it, but it packs in some good specifications. Similar to the Galaxy Golden, the SM-W2014 has got a 3.67-inch capacitive touchscreen, and it’s a Super AMOLED display that comes with the screen resolution of 480 x 800 pixels. Despite the small size, the processor that is included would power the device well, because Samsung has included the 2.3 GHz quad-core Snapdragon 800 processor in it, and RAM included with it is a 2GB one. The device would be running the Android 4.3 Jelly Bean OS and the cameras included on the device are as follows – 13-megapixel rear camera with the LED flash, and 2-megapixel front facing camera. Having a Single-SIM with the 3G data network connectivity, the Samsung SM-W2014 has got a thickness of 15.79mm, and it weighs around 173gm.